I am a keen reader of your Herald Express column and have downloaded some useful free software as a result.I was wondering if you know of any free downloads of Home Accounting software so I can manage simple income & expenditure, ability to categorise entries & bank reconciliation?Nothing too sophisticated. My problem locating a suitable piece of software for John has been compounded by the fact that such software seems to polarise users easily; the same piece of software will typically receive just as many 5/5 reviews as it does 1/5 reviews.I’d imagine that since accountancy software has such a steep learning curve that for everyone who gives up after two minutes, there is another that perseveres and finds the application quite capable once the surface has been scratched. 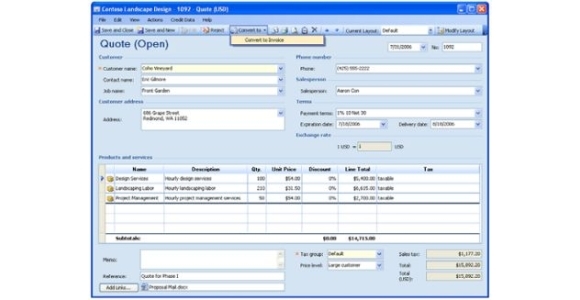 After a good look around I settled on Microsoft Office Accounting Express 2008.This decision pains because although it is free, this application is a huge 250mb download and this in my eyes is excessive for any application, let along one designed for simple bookkeeping. My decision has been reached because, unlike most of the accounting software which has a habit of looking alien, this package looks and feels very similar to Office which should result in a much less steep learning curve. There is a more comprehensive paid for version of the software available however the Express package covers most imaginable needs of a home user or small business owner.You can create invoices and quotes, generate sales and returns, input bills and charges as well along with more modern features such as eBay and Paypal integration.Those that are VAT registered can generate their VAT returns through the application and those with employees can take care of the Payroll. You are also able to import your existing financial data from other applications such as Microsoft Excel, Microsoft Money or Quickbooks along with importing and reconciling online bank statements. To get started simply visit www.msofficeaccounting.co.ukand click the ‘download free express’ link and you will automatically be redirected to the download site designed for the UK version of this software complete with pound signs and UK taxation systems.It’s very rare that Microsoft release anything for free that could be considered fully featured and although this application does have its faults I am confident that providing you can stomach the large download then you won’t be disappointed.